1991 H-Reg Mercedes Benz 190E 2.5L - 16 Cosworth Automatic Saloon car. Here is a rare, once in a lifetime opportunity to acquire a motoring history classic. This car was exhibited at Mercedes Benz World Brooklands and it was the Feature car for the EVO Story at Mercedes Benz World. Interesting Provenance. Last owner was Mike Hall. Hall was the late famous chief designer and director at Cosworth during the 1960's to the 1980's and has owned this car for the last 24 years, Mike was instrumental in the design of both 2.3-16 and 2.5-16 engines for the Mercedes 190 E. This was his pride and joy and was maintained with no expense spared. Was hand picked by Mike. Extensive body restoration was carried out in 2011, photograph evidence all present. Full Service History stamped all up to date with 32 service history maintenance stamps. Just been recently serviced costing over £3000. Old MOT's dating back to 1997 to present. Extensive service history file all documented includes original bill of sale. Finished in Smoke Silver. Full Black Leather Seats. Electric Power Sunroof. Automatic. Current MOT til March 2019. You will be pushed hard to find another like this again. We believe this is truly a one off example. PX Welcome. 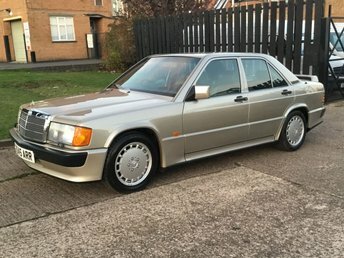 These Original 190e Cosworth's are becoming very rare and sought after and this particular car having excellent provenance will be a very valuable collectable. For more information please call us or email anytime. Get the best deal on a used Mercedes-Benz 190 car for sale in Leicester by making your way to Leicester Van Centre today. You will find every available model listed here on the website, and as all our stock is competitively priced you should have no problem sourcing a pre-owned Mercedes-Benz to suit your budget. Take the opportunity to browse our current range online before contacting a member of the showroom team to find out more. Our friendly and knowledgeable staff will be more than happy to answer any questions and provide advice and guidance when necessary. Alternatively, why not pay a visit to our showroom in person and take a closer look at the selection of used Mercedes-Benz 190 car models for sale.